Get ready! 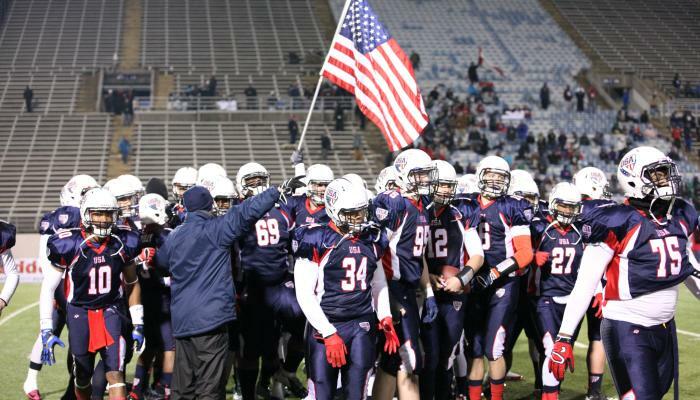 The U.S. National Teams are coming back to Arlington for USA Football’s International Bowl IX! The competition will be held January 12, 17, and 19 at AT&T Stadium, home of the Dallas Cowboys. Watch some of the most talented players in the United States take on teams from Canada, Japan, Mexico, and the Nordic nations. Here are four reasons why you won’t want to miss the largest international high school football competition. As the national governing body of football, USA Football is entrusted to build the U.S. National Teams with the best and brightest talent in nation. The International Bowl is the pinnacle and final step for the National Teams program, where athletes get a chance to represent the Unites States as they compete for bragging rights against teams across the world. This sports and entertainment mecca has hosted the Super Bowl, an NCAA Final Four, and countless football bowl games. The best part? You get to experience the stadium for yourself as you watch some of the best high school players nationwide battle it out on the iconic Dallas star. It’s not often that American football gets played on an international stage. Come see the world’s best and brightest high school football players go head to head! Get even closer to the action with a field pass, the exclusive way to fully immerse yourself in the competition. Don’t miss this unforgettable opportunity to watch America’s game get taken on by the world! Ready to purchase your tickets? Get them HERE today.